Brave New World: The Polarisation of the Civic Library? In stark contrast to the new £188 million Library of Birmingham, we read of yet more cuts of some 20% to library service budgets in Anglesey, of potential closures to local libraries in Southend and across Lincolnshire and many other areas. Over 200 libraries have closed over the last year and Library campaigners are predicting some 400 closures in the next three years. 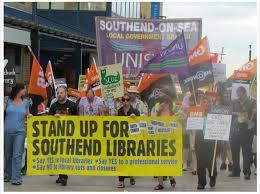 Southend however are not just closing libraries but are spending 27 million on The Forum, a state-of-the-art library being delivered by the Council, the University of Essex and South Essex College. So are we seeing a shift towards a centralised civic library and away from the local community one? Is this a wise move and are there other potential options? If we forget the emotional rhetoric of the need to save our heritage, versus the cold blooded reality of having to cuts costs, do we have a potential to redeploy spending and potential meet the needs of all? Many councils are looking to somewhat blatantly to breathe life into their library services and these ideas include library relocations, using volunteers, and increasing income. But is this merely sticking a plaster over a heavily bleeding patient? Some may suggest that it is a pity it took many until public spending cuts had to be made, to galvanise their thinking and responses. This sudden reaction has itself created opposition and polarisation of positions, which may have been avoided if the authorities had acted progressively and proactively over the years. But we are where we are today. Birmingham’s new library covers some 31,000 square metres over 10 levels and houses over 400,000 works which all be readily available to the public. This is twice the number of works which were available in the previous central library. 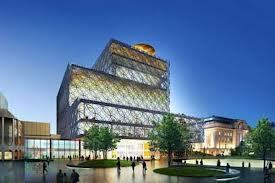 It is also seen as an iconic landmark building and Birmingham’s answer to the many new landmarks such as London’s Shard. Some would suggest that this prestigious civic statement is reminiscent of the Victorian era when buildings like libraries were seen a civic statement of wealth and prosperity. In contrast, the Lincolnshire authority is looking to reduce the number of libraries under its control from 47 to 15, in a bid to save £2 million and is hoping that many local communities will step in to take over the running of some libraries in rural locations. In an interesting twist the Lincolnshire Co-operative has offered to join forces with the council to keep six of the libraries open and also some 21 communities have expressed an interested in becoming involved in running local library services. We have written about this subject and we often forget the relative short history of the public library in the UK. With more public private partnerships such as the Lincolnshire Co-operative, we may now also be seeing a return to the subscription and circulating libraries? We have to recognise that change is happening all around us. As a result of; technology, networks and mobile connectivity, we are changing how we communicate, discover, research, consume media and the media itself is changing. We are not advocating a ‘digital only’, monolithic database that is only accessible over the net. Far from it. Southend however are spending 27 million on The Forum, state-of-the-art library being delivered by the Council, the University of Essex and South Essex College. But neither are we advocating the status quo, where in many cases books lie dormant on shelves in local buildings, because they have done so for the last hundred years. The publishing industry is often the first to jump on the barricades to defend the libraries, but its track record to date in enabling digital lending has been somewhat questionable and some would suggest self-centred. In a world, where for many the community is both local and virtual, maybe it’s the redefinition of the community library hub we are trying to grapple with. Libraries are often seen as book depositories and although many have tried to change this image, to many it sticks. But today we have libraries such as Amazon with every book available in both print and digitally, Google with its search engine and the online encyclopaedia that is Wikipedia. Merely replicating these is not what a civic library is best equipped or resourced to do. As the book evolves and media extends some past the spine, we have to also ask how we incorporate the book into a widening remit, whilst protecting the library as a centre of knowledge and expression. Can You Define Tomorrow's Digital Library? Can the Public Library Deliver That Golden Egg?